A heist movie in the classic Hollywood tradition, "Ladron Que Roba A Ladron" follows two crack thieves, Emilio and Alejandro, who reunite to rob the biggest thief they know – Moctesuma Valdez, a TV infomercial guru who's made millions selling worthless health products to poor Latino immigrants. Valdez's empire is next to impossible to infiltrate. But Emilio and Alejandro know if they go undercover as day laborers – chauffeurs, gardeners, maids, and repairmen – they can rob Valdez blind right under his nose. It's a perfect plan... except that no one on their team wants the job. Refusing to give up, Emilio and Alejandro come up with a solution so insane it might just work – use real day laborers. Within days, they form a team of criminal amateurs with just the right skills. There's Julio, a TV repair shop employee who's also an electronics expert, Rafa and Rafaela, a valet and his mechanic daughter in charge of transportation, Miguelito, a Cuban refugee actor and master of disguises, and the metro-sexual ditch digger, Anival, who plays the token heavy. None of them has ever committed a crime in their lives, but this motley crew of underdogs – so often taken for granted – is ready to face impossible odds and "receive 100 years of forgiveness." 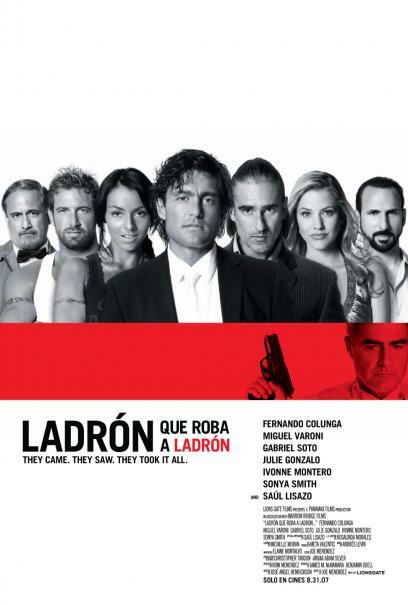 Full of humor and heart, "Ladron Que Roba A Ladron" proves that being underestimated is sometimes your best advantage.